Having a well-crafted dish for lunch can make anyone’s meal enjoyable, and addition of a dessert plate after the lunch will add extra charm to the meal that will exist even after the lunch has been finished. And you will bound to say Ahhhh… what a meal I have taken! Having best-branded subwoofer for a music system is always exciting; if the subwoofer is powered one, the taste of the sound surely surpasses the taste of your favorite dish. If you are aiming for an easy, off the shelf and space-saving bass system in your vehicle, a powered subwoofer is the best solution for you. A powered subwoofer combines woofer and amplifier in a single enclosure to deliver the listener mesmerizing bass. The best side of this powered subwoofer is it will not take much space in your vehicles but add much bass in your system. However, finding a well-performed powered subwoofer is always a challenge, so I am here to help you win the challenge. The Rockford Fosgate P300-12 Punch 300 Watt Powered Loaded 12-Inch subwoofer is the best powered subwoofer in the market. Wanna know how it will mesmerize you? Are you aiming to boost up your sound without all the headaches of matching up a subwoofer with a compatible amplifier and enclosure? If yes, the P300-12 is the right one for the job. The Rockford Fosgate P300-12 features a punch 12-inch powerful subwoofer in a custom sealed enclosure which is powered by 300-watt impressive amplifier. The entire system is fully ready to use you just run the power ground and a signal from the source to enjoy the enchanting bass. For the protection against shock, the subwoofer features a durable exterior that resists scrapes and bumps while the subwoofer is placed in the trunk or cargo area. Here is the main features of Rockford P300 punch p300 12 subwoofer which made best powered subwoofer. Rockford Fosgate Punch p300-12 is made with modern tech components that will provide a tune fan punch hard, clean bass, without the additional rattles. The subwoofer has Built-in adjustable bass boost EQ to deliver dynamic bass. It also has -Intelligent auto turn on/off function that will shut down the subwoofer automatically when the playlist is over. The most convenient point of this powered subwoofer is you can disconnect the connectors from the subwoofer within minutes. If you have limited trunk space for subwoofer placement, you can effortlessly place or remove it disconnecting the connectors. This Rockford P300 12 is perfect for most music lovers since it provides the listener sufficient volume with a little vibration. The subwoofer also has a built in 300-watt amplifier which will save you extra cost of buying an amp at the same time boost up your bass. Closed loop design ensures optimum performance between woofer, amplifier and the enclosure. The subwoofer also has built-in 0°/180° phase switch. Thermal and over voltage protection ensures sufficient flow of electricity along the subwoofer, which guards downstream circuit from being damaged due to excessive flow of electricity. The subwoofer is surrounded by 5/8 inch medium density fiberboard which is more stable than solid wood and survives better in heat and humidity. Remote bass level control let you adjust the level of your amplifier from the front seat, so you can keep the whipping high or even low using your fingertip. Provides great bass even in low levels. Solid cover and voltage protection. There are some lackings in volume. Inefficient Velcro mounting causing the subwoofer to shake and rattle and distort the bass sounds. Answer: I’m not 100 % sure but I think you should check the subwoofer’s dimensions against what you have in your vehicles. Will this fit under the rear seat in a 2013 F-150 crew cab? Measurements are tight; specs say one side is 8.82″ and other is 5.98″ for depth. Does this subwoofer last longer than 1 year? Answer: Offcourse, it will last more than 1 year. Does this come with the amp kit? Does the built in amp give enough power to sound loud, or need a better one? Answer: It is ok, it is not earth shattering bass. I have a 1996 Civic and it sounds good in my car. Can i use it as house speaker? Subwoofer performs best when it perfectly matches with the perfect stereo system. Rockford Fosgate 12 ” is the best powered amplifier for this range. I think if you match it correctly with your vehicle’s stereo system, it will produce its best for you. Rockford Fosgate Punch 12 inch sub has all the features to meet your listening demands. The internal side of the powered subwoofer is made with powerful 300watt amp, built in bass EQ, remote bass control system, and voltage protection tech and the outer side of this top grade subwoofer made with 5/8 inch medium density fiberboard. 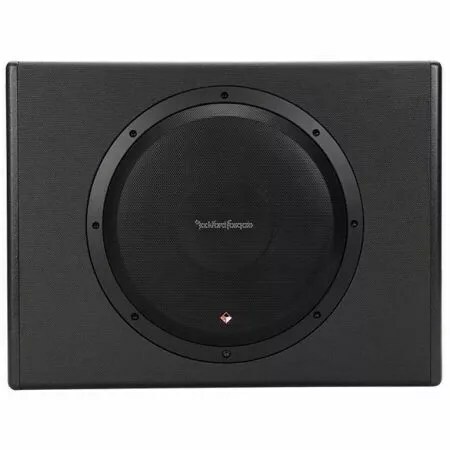 Additionally, easy removing connectors, easy placement, and the auto turn off facilities make this subwoofer best buying candidate for the music lovers around the globe.